Nimr Baqr al-Nimr, commonly referred to as Sheikh Nimr (Arabic: نمر باقر النمر‎ or Nimr Baqir al-Namr, Nimr Bakir al-Nimr, and Nemr Baqir al-Nemr) is an independent Shia Sheikh in al-Awamiyah, Eastern Province, Saudi Arabia. He is popular among youth and critical of the Saudi Arabian government. He claimed that he was beaten by Mabahith when arrested in 2006. In 2009, he criticized Saudi authorities and suggested secession of the Eastern Province if Saudi Shias’ rights were not better respected. A warrant for his arrest was issued and 35 people were arrested. During the 2011–2012 Saudi Arabian protests, al-Nimr called for protesters to resist police bullets using “the roar of the word” rather than violence, predicted the overthrow of the government if repression continued,and was seen by The Guardian as having “taken the lead in [the] uprising”. On 8 July 2012 al-Nimr was shot by police in the leg and arrested, in what police described as an exchange of gunfire.Thousands of people protested in response in several protests in which two men, Akbar al-Shakhouri and Mohamed al-Felfel, were killed by police bullets. Al-Nimr started a hunger strike and appeared to have been tortured. The Asharq Center for Human Rights expressed concern for al-Nimr’s health during his hunger strike on 21 August, calling for international support to allow access by family, lawyer and human rights activists. 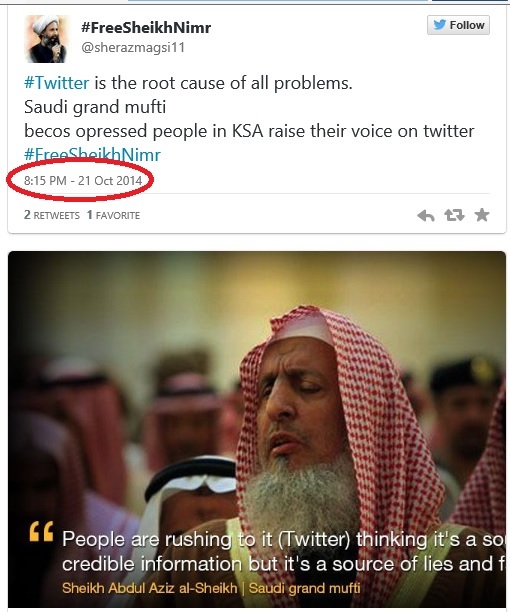 On 15 October 2014, al-Nimr was sentenced to death by the Specialized Criminal Court for “seeking ‘foreign meddling’ in [Saudi Arabia], ‘disobeying’ its rulers and taking up arms against the security forces” and his brother, Mohammad al-Nimr, was arrested on the same day for tweeting information about the death sentence. 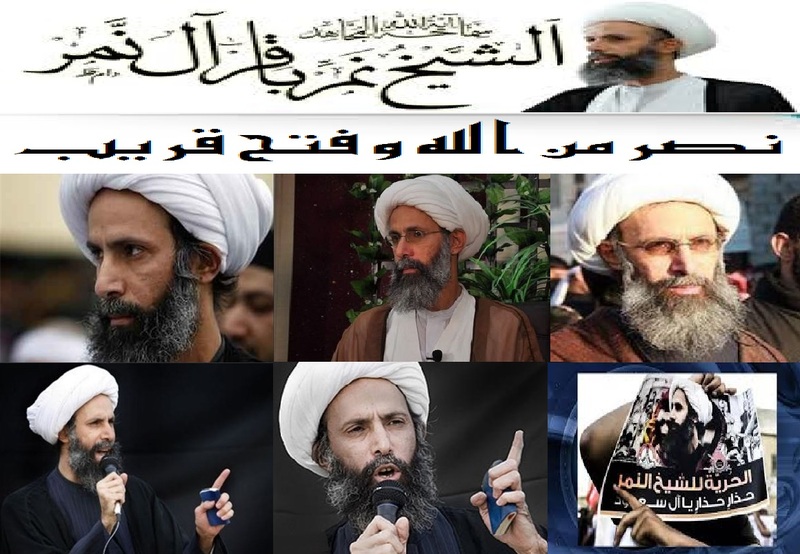 Al-Nimr has been a Shia Sheikh in al-Awamiyah since 2008 or earlier. He studied for about ten years in Tehran and also studied in Syria. He initially followed Grand Ayatollah Mohammad Hussaini Shirazi and as of 2008, followed Grand Ayatollah Mohammad Taqi al-Modarresi. As of 2008, he was independent of the two main political groups in the Eastern Province Shia community, Islahiyyah (the Shirazis) and Hezbollah Al-Hejaz (Saudi Hezbollah). Al-Nimr has been the Friday prayers leader in al-Awamiyah since 2009 or earlier. Al-Nimr supports “something between” individual and council forms of guardianship of the Islamic Jurists as a form of government.He supports Kurdish majority control of Iraqi Kurdistan. 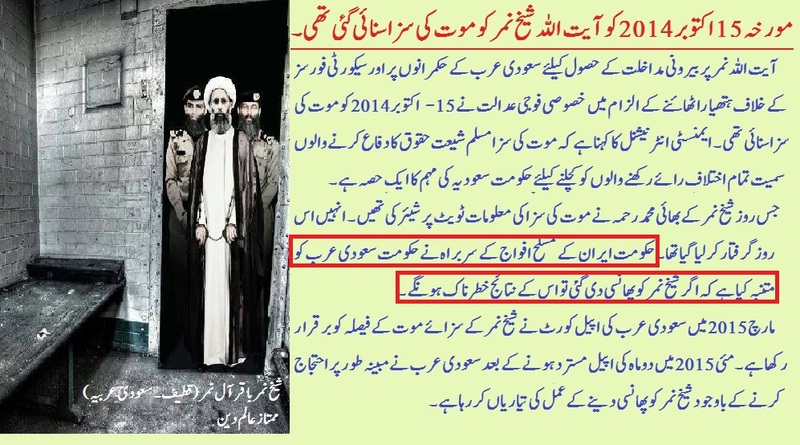 Al-Nimr believes that Shia ayatollahs would not promote violence and “murder in the name of God”. He supports “the idea of elections”. Al-Nimr stated that the United States (US) “wants to humiliate the world.” In August 2008, he said that he sees US citizens as a natural ally of Shia as the thinking of both US citizens and Shia is “based on justice and liberty”. He believes that the Saudi state is “particularly reactionary” and that “agitation” is needed to influence state in general and the Saudi state in particular. According to John Kincannon, Counselor for Public Affairs at the U.S. embassy in Riyadh, Al-Nimr has made statements “perceived as supporting Iran”. In August 2008, he stated that he believes that Iran and other states outside of Saudi Arabia act mainly out of self-interest, not out of religious solidarity. Al-Nimr stated that in the case of internal conflict in Saudi Arabia, the Saudi Shia would have the right to ask for international intervention in analogy to requests for foreign military intervention by Kuwaitis and Saudis to the US in the 1990–91 Gulf War and people from Darfur during the War in Darfur. Al-Nimr criticised Nayef bin Abdul-Aziz Al Saud, who was crown prince of Saudi Arabia, following Nayef’s death in June 2012. He stated that “people must rejoice at [Nayef’s] death” and that “he will be eaten by worms and will suffer the torments of Hell in his grave”. Al-Nimr was described by US diplomat Gfoeller as “gaining popularity locally” in 2008. The Guardian described him as “[seeming] to have become the most popular Saudi Shia cleric among local youth” in October 2011. He retained his popularity in 2012, with thousands of people participated in Qatif street demonstrations in his support following his July 2012 arrest. Al-Nimr was detained for several days in 2004. He was arrested by Mabahith in 2006 and beaten during his detention. Residents of al-Awamiyah campaigned to support him and he was released after several days. 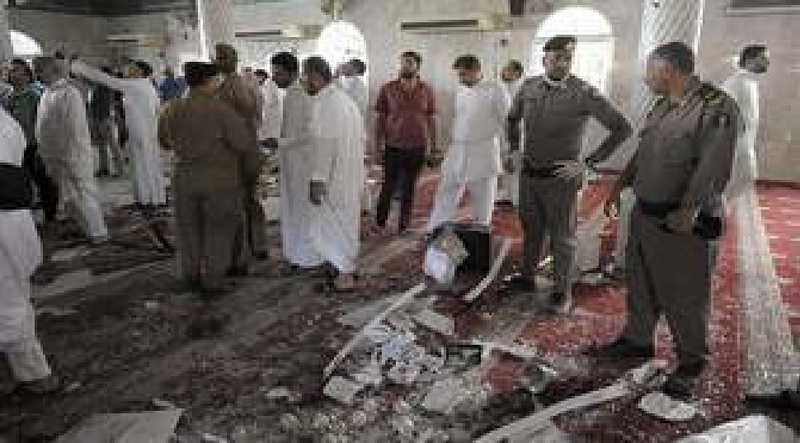 In February 2009, an incident occurred in Medina involving differences in Shia and Sunni customs at the tomb of Muhammad, filming of Shia women by the religious police, protests by Shia in Medina and arrests. 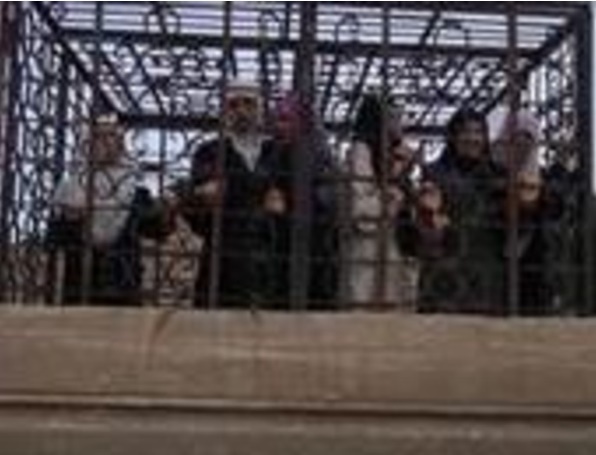 Six children were arrested during 4–8 March for taking part in a 27 February protest in Safwa. A warrant for his arrest was issued in response. 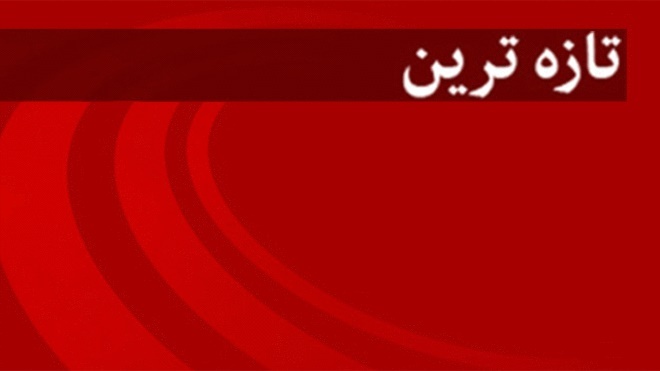 Protests took place in al-Awamiyah starting 19 March. 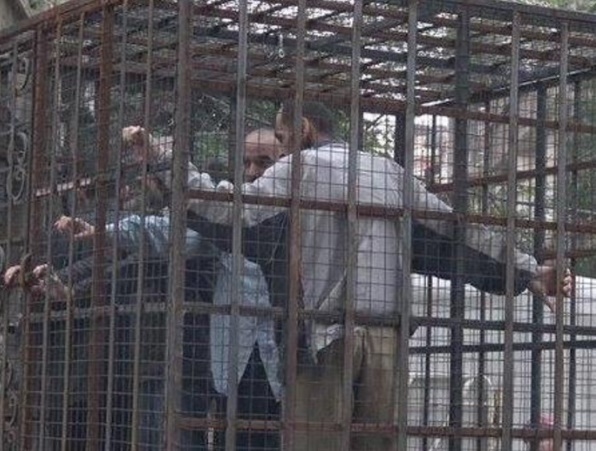 Four people were arrested, including al-Nimr’s nephew, ‘Ali Ahmad al-Faraj, aged 16, who was arrested on 22 March. The police started tracking al-Nimr in order to arrest him and tried to take his children hostage. By 1 April, a total of 35 people had been arrested and security forces installed checkpoints on roads to al-Awamiyah. As of 1 April 2009, al-Nimr had not been arrested. In January 2012, he called on authorities to “stop bloodshed”, predicting that the government would be overthrown if it continued its “month-long crackdown” against protestors. 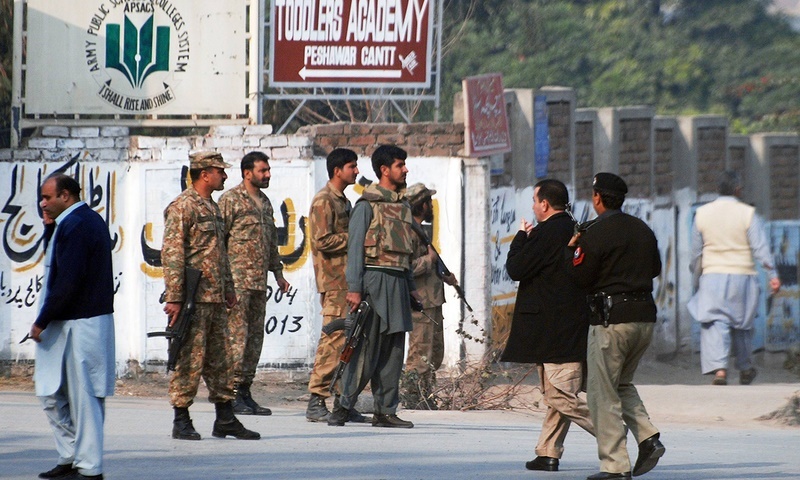 He criticised a list of 23 alleged protestors published by the Ministry of Interior. The Guardian described him as having “taken the lead in [the] uprising”. 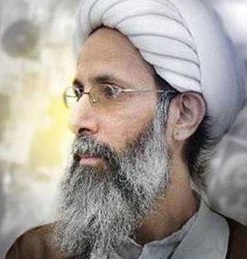 On 8 July 2012 al-Nimr was shot by police in the leg and arrested. According to Ministry of Interior spokesperson Mansour al-Turki, policemen tried to arrest al-Nimr and colleagues who were in a car. Al-Nimr and his colleagues fired live bullets at the policemen, police shot their guns in response, al-Nimr and his colleagues attempted to escape and crashed into a police car. According to al-Nimr’s brother Mohammed al-Nimr, Nimr al-Nimr was arrested “while driving from a farm to his house in al-Qatif”. The Saudi Press Agency stated that al-Nimr was charged with “instigating unrest”. Mohammed al-Nimr said that his brother “had been wanted by the Interior Ministry for a couple of months because of his political views”. Thousands of people protested in response. 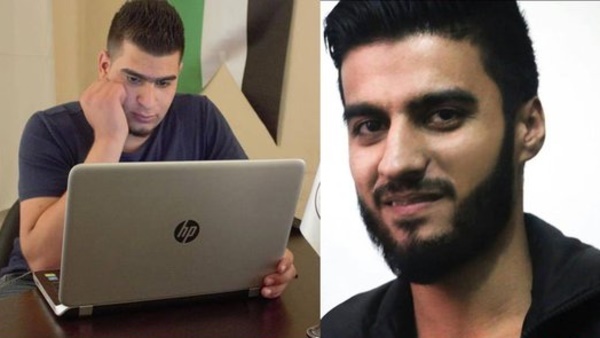 Two men, Akbar al-Shakhouri and Mohamed al-Felfel, were killed in the protest. Pictures of al-Nimr “covered with what appeared to be a blood-stained white blanket” were published online by Eastern Province activists. On 16 July, activist Hamza al-Hassan stated that al-Nimr had received a brief visit by his family during which officials stated that the purpose of the visit was to request al-Nimr’s family to “calm the angry protestors”. According to al-Hassan and Press TV, al-Nimr had been tortured, had bruises on his face and had broken teeth”. On 19 July, al-Nimr’s family said that al-Nimr had started a hunger strike. Al-Nimr’s family visited him again on 22 July. They stated that he had been badly tortured, with signs of torture on his head, that he was continuing his hunger strike, and that he had weakened. Al-Nimr’s wife, Muna Jabir al-Shariyavi, died in a New York hospital while he was imprisoned. 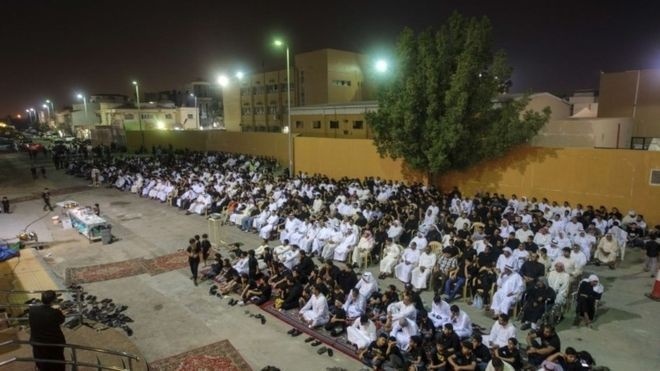 Two thousand people attended the funeral in Safwa on the evening of 30/31 August, called for al-Nimr to be unconditionally freed, for all Shia and Sunni detainees to be freed, and chanted “Down with Hamad”, “Bahrain Free Free, Peninsula Shield out”. On 21 August, the Asharq Center for Human Rights expressed concern that al-Nimr was on the 45-th day of his hunger strike while in prison and said that he had not been charged. The Asharq Center appealed for international support for allowing access to al-Nimr by his family, lawyer and human rights activists. Amnesty International stated that apart from the charge of firing at security forces on 8 July 2012, the other charges, of “disobeying the ruler”, “inciting sectarian strife” and “encouraging, leading and participating in demonstrations” were based on documentary evidence of al-Nimr’s sermons and interviews. Amnesty viewed these as representing the right to free speech and that al-Nimr did not incite violence in these. Amnesty stated that witnesses whose testimonies were used during the trial did not testify in court and that al-Nimr’s lawyer was not given a fair possibility to defend him. The European Saudi Society for Human Rights (ESSHR) reported details of five of al-Nimr’s court appearances following the 8 July 2012 arrest. According to the ESSHR, 33 charges were laid in the first appearance, on 25 March 2013. 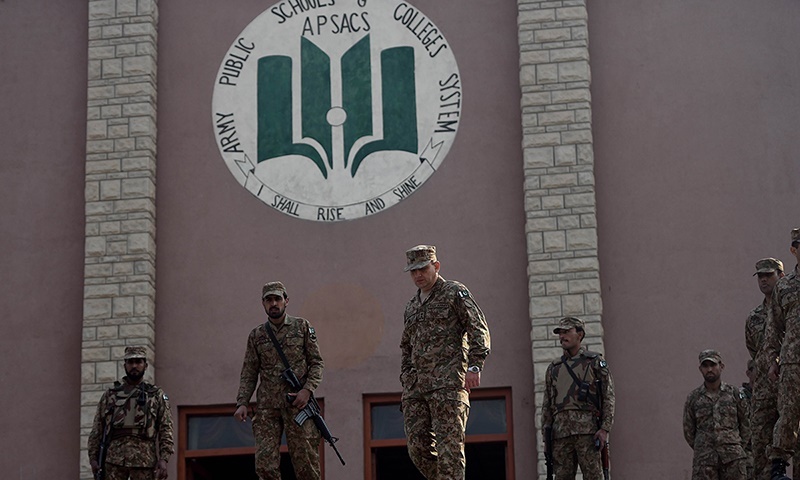 On the 29 April 2013 court appearance, the defence was unable to respond to the charges because it did not have the details of the list of charges. On 23 December 2013, al-Nimr’s lawyer said that al-Nimr was unable to respond to the charges because he did not have a pen and paper. Al-Nimr’s lawyer was informed one day before the fourth appearance, on 15 April 2014. The ESSHR stated that neither al-Nimr’s lawyer nor his family were informed prior to the fifth court session, on 22 April 2014. Nimr al-Nimr’s brother, Mohammad al-Nimr, tweeted information about the death sentence and was arrested on the same day. The head of Iran’s armed forces warned Saudi Arabia that it would “pay dearly” if it carried out the execution. In March 2015 the appeal court of Saudi Arabia upheld the death sentence against Sheikh Nimr al-Nimr. In May, two months after rejecting the appeal, the Saudi government is allegedly preparing to execute the Sheikh any time despite protests. On October 26, 2015, the Supreme Court of Saudi Arabia upheld the death sentence. On Saturday 8 November 2014, there was a demonstration outside Downing Street where Amina Taylor of Press TV (London) conveyed the Britons’ request to the head of the UK Government for his intervention on behalf of prominent Saudi Arabian Shia cleric Sheikh Nimr who was handed the death sentence in October 2014. Reportedly on 13 November 2014 Muslims of different nationalities including Afghan, Iranian, Indian, Pakistani, Iraqi and Lebanese gathered in an organized protest in front of the United Nations against the death sentence of Sheikh Nimr and raised their voice for the freedom of all political prisoners in Saudi Arabia. In March 2015 Nigerian people staged a protest in the city of Kano against the detention and death sentence of Sheikh Nimr al-Nimr, according to Tasnim News Agency. On 13 May 2015 Shia marjas Ja’far Sobhani, Naser Makarem Shirazi, and Hossein Noori Hamedani condemned the death sentence. Aware of the imminence of the execution of Sheikh Nimr in May 2015, Shia Muslims all over the world have staged peacful rallies and forwarded their petition to UNO to prevent the death sentence. 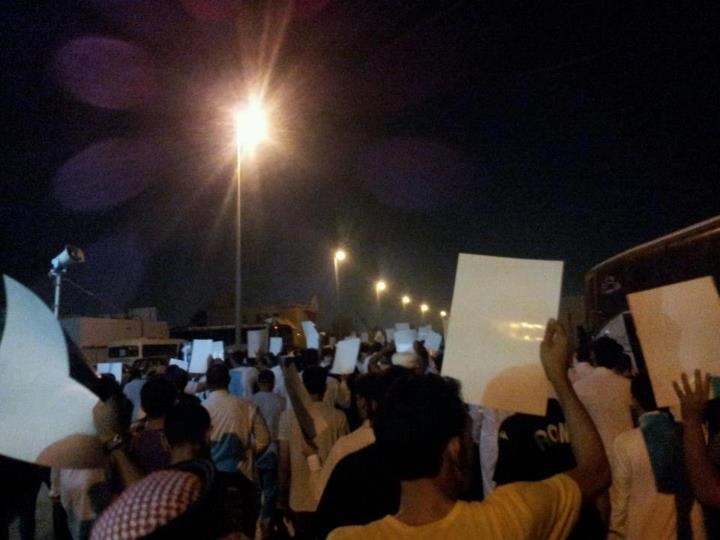 Protests intensified and people took to the streets in Saudi Arabia, Bahrain, India and Iraq. In Iran, the only country with a predominantly Shiite population in the Middle East, clerics and scholars staged a mass sit-in on 13 May in Qom and Mashhad, to show their solidarity with Sheikh Nimr and record their agitation. On 17 May 2015 Ahlul Bayt News Agency reported a peaceful protest rally in solidarity with Sheikh al-Nimr staged in Berlin, Germany. Demonstrators demanded the Saudi Government to immediately release Sheikh Nimr and drop all illegal charges against the Shia Saudi cleric. The protesters also condemned the systematic and widespread violations of human rights in Saudi Arabia. Nimr al-Nimr’s nephew, Ali Mohammed Baqir al-Nimr, who participated in the 2011–12 Saudi Arabian protests, was arrested in 2012, sentenced to death in 2014, and As of 23 September 2015, expected ratification of his sentence by King Salman of Saudi Arabia, to be carried out by beheading and crucifixion.